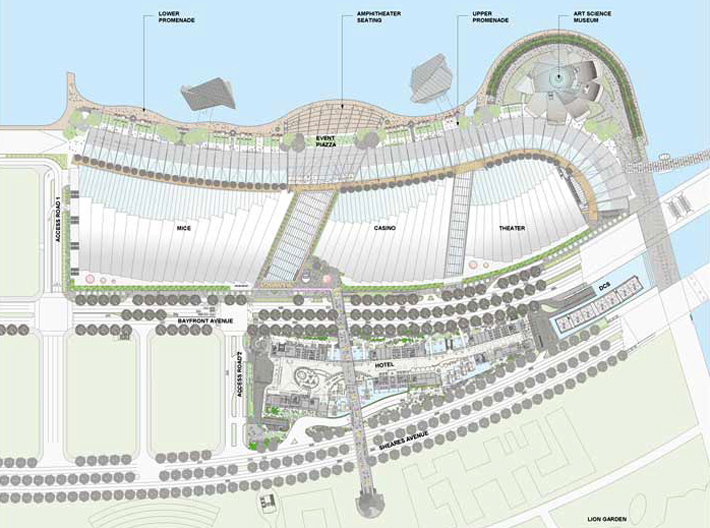 PWP worked with the Singapore government, Moshe Safdie, and a team of local landscape architects and horticulturalists as well as engineering, architectural, and business professionals to create the landscape for this project at the entrance to Singapore Bay. It includes a public waterfront promenade, a public rooftop promenade, and a 1,000-meter-long landscaped bridge. The 2.5-acre Skypark spans the roofs of three hotel towers on the 57th floor and offers views of downtown Singapore. 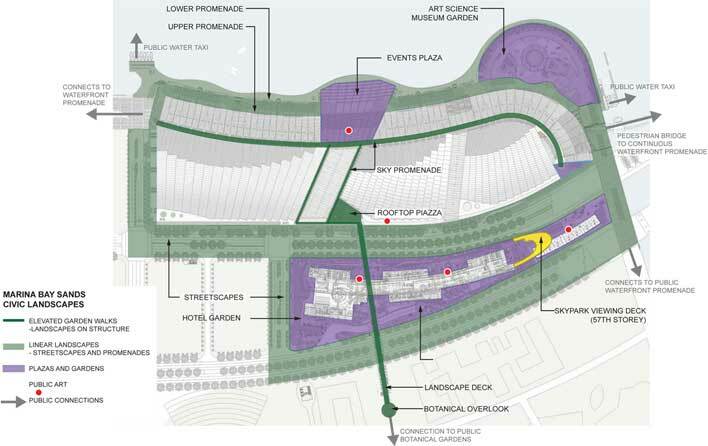 Landscape occupies nearly 30 acres at Marina Bay Sands, 75 percent of which is public space and almost all of which is on structure. The half-mile-long Waterfront Promenade features a triple allée of Roystonia palms interspersed with informal groupings of large canopy trees—Khaya, Peitophorum, and Alstonia—a design that provides both scale and much-needed shade. Permeable pavement systems collect surface drainage and reduce runoff. The Skypark, a surprising garden in the sky, features a swimming pool with an infinity edge, garden rooms of lush plantings and mature trees, a public viewing deck, and three restaurants. PWP conceived of an early tree-procurement strategy as well as a temporary-nursery plan that permitted plants to be sourced overseas from many locales and facilitated the installation of large quantities of mature trees with a high success rate.